When/Where would you like it moved? What vehicle are you moving? Individualized Shipping Container – We use individual shipping containers for each classic vehicle. Our shipping containers are secure and climate controlled so you know your classic vehicle will arrive safely. Protection – All vehicles shipped via enclosed transport are safe from weather and road debris. Your vehicle will arrive in the same condition it left. Increased Insurance – In enclosed transport, each carrier is insured at 1 million dollars per vehicle shipped. In open car carriers, each vehicle is insured at only 100,000 dollars each. With this added insurance protection, you know you will be covered if the unthinkable happens. Do you have an exotic car, luxury car, vintage luxury car or restored car you want to be transported? We Will Transport It is the best classic and exotic car shippers to meet all your needs at the best rates. Transporting exotic automobiles require special care and attention. Let us help you ease your worries and concern! With extensive experience in providing Exotic Car Shipping, Shipping Classic Vehicles services, we know what needs to be done to safely transport your automobile. Shipping Classic Vehicles. Regardless of whether you have to move your classic car across the country over to your new home or get it to an out of state vehicle appear, let We Will Transport It help remove the worry from transporting your work of art, vintage or old fashioned, classic vehicle. We will help you to transport your great classic vehicle, enable you to get rates from solid bearers and give you some supportive insights the way. 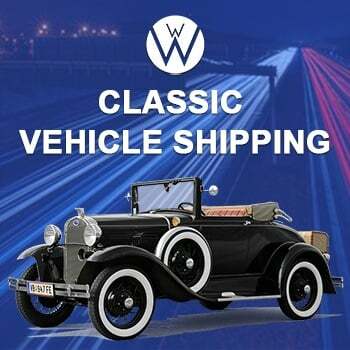 Best Classic Vehicles Shipping Company in the US. We Will Transport It has many years of experience in shipping classic vehicles. We have the know-how and the ability to transport any classic vehicle within the continental U.S. or Canada. Your vehicle is more than an investment. For you, it is a labor of love and a work of art. Rest assured that we will take care of it for you. Because of the inherent value attached to classic vehicles, we at We Will Transport It suggest enclosed transport for shipping classic vehicles. We at We Will Transport It have drivers that are 100% licensed, insured, bonded, and have a 10-year clean MVR record. Our drivers are fantastic, but if we are not the shipping company for you, do not hesitate to ask us about our list of insured, bonded, and licensed classic vehicle shipping companies that we have on file. We can find a shipping company that will meet your needs at a competitive price. Your classic vehicle is important to you, but you don’t want to have to pay an arm and a leg to move it somewhere safe. In addition to finding you a shipping company that will fit your needs, We Will Transport It will help to facilitate communication between you and your shipping company so that you are always well informed. Your classic vehicle is safe in our hands or the hands of any company we suggest. If we can’t ship it, we will find someone who can ship it for you. Shipping your classic vehicle should not be a terrifying experience. If you have sold a classic vehicle, purchased one at a distance, or are shipping your classic vehicle for a car show, we at We Will Transport It will make sure it is delivered safely. Shipping Classic Vehicles. We Will Transport It has many years of experience in shipping classic vehicles. We have the know-how and the ability to transport any classic vehicle within the continental U.S. or Canada. We are a International Classic Car Shipping Company. We Will Transport It, the Best Shipping Classic Vehicles Company in the U.S.
Strong customer service for us, is the number one goal because we owe it to you! The only real disadvantage for enclosed transport is the price. Enclosed transport can be at least twice as expensive as open transport. This is due to the number of vehicles on the carrier. We can hold 8-10 cars on an open transport carrier, but only 2-4 cars on an enclosed transport carrier. However, as we said earlier, the added protection more than makes up for the cost. Antique Car Transport, Classic Auto Transport, Classic Car Transport, Shipping Classic Vehicles.